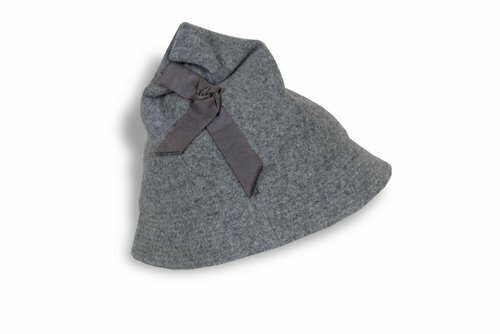 Conical gray wool hat with a quilted brim. Point of crown is folded over, stitched to side, and trimmed with gray grosgrain bow. Found in the Emporia, Kansas, home of William Allen White and Sallie Lindsay White. William Allen White was a famous progressive era newspaper editor. This hat was probably worn by White's daughter-in-law, Kathrine Klinkenberg White, who married William Lindsay White in 1931. The couple lived in Emporia while editing the Gazette newspaper after William Allen White's death in 1944.